We left Spain on Monday of last week, but there are several things from that leg of our trip which I want to share before I move my blog on to Paris. You may remember that I was trying to brush up on my Spanish. By that I mean – attempting to remember what I learned in my two years of high school Spanish and trying to learn enough to order at a restaurant, get directions, purchase items from a store and the like. I found my Spanish-speaking skills muy util (very useful), especially when speaking with people who spoke English. I was excited when a local man told me that I was speaking well, even though I think he was being kind. Mostly I fumbled for the correct noun and pointed a lot. I felt like a toddler. Quiero esto (I want this). The most popular question I asked was “Habla ingles?” (Do you speak English?) I had a great time trying to communicate and found the Spanish people so gracious and helpful. My son, Joe, has been immersed in French since they moved to Paris two months ago. He speaks it well. Often he would say the French word for something and then I would say the Spanish. When we moved on to Paris the problem was Bob and I kept thinking in Spanish. I really enjoyed hearing Bob tell the French “gracias.” You get the phrases of one language down, and then you move on to another language! It’s not exactly a seamless transition. Resort amenities in Europe differ from those in the states. For instance, our resort had a washing machine and a dryer. The washer was small and confusing. 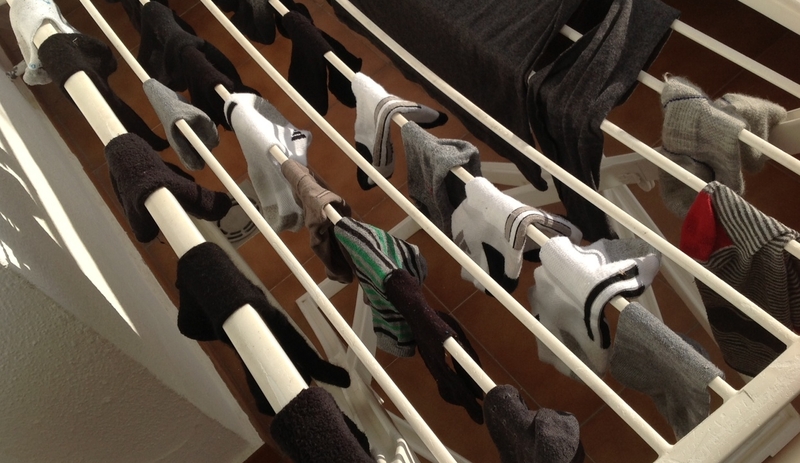 The dryer was easy to operate. Driving in Southern Spain was an experience of its own. Bob did an admirable job. The trip from the airport to our resort was most exciting. We got off at the wrong exit and were quickly lost. As you may know, roundabouts are all over the place in Europe, so you can literally find yourself going in circles. We finally stopped at a tienda (store) and right away I was up to bat as the clerk did not speak any English. Tiene un mapa, por favor? (Do you have a map? – I think I learned that question from Dora the Explorer.) We bought a map, but unfortunately it was not one that was helpful to us; so we backtracked and found our way. Our directions said that the resort was right off of the highway. Look for camping, then a castle, then a petrol station and turn right. They were serious, too. Right after the petrol station we had to quickly slow from our 50 mph to make a sharp right turn with no off ramp. We held on tight as Bob made the turn without having anyone rear-end us. We soon discovered that you can’t make a left turn in this region. There were signs that looked like someone had fun drawing intersecting lines that indicated we could turn left by turning right. Then we were led to a roundabout (if we were lucky), and then back on to the original road so we could turn right. Also, the signage was confusing. So many signs along the highway pointing to the same exit that we often thought we had missed our turn or we sometimes turned where the sign was and ended up on a service road. When we flew to Barcelona and left our rental car behind, Bob was happy to take a taxi or the subway for the rest of our trip. We were excited to have tapas in Spain. We found the perfect spot in Barcelona to have an authentic lunch. I am not very adventurous when it comes to eating, but I did try every one of the tapas we ordered, even the octopus, which was disgusting. They came with their heads on them and their little legs curled up. Everyone else popped the whole repulsive thing in their mouth; I cut off a little piece – just couldn’t bring myself to eat the head. Everything else was amazing, well maybe not the squid and mushrooms, they were only good. Also, while we were in Barcelona we witnessed a protest against some taxation issue. The streets were being closed by the police and parades of people with signs in hand and music playing marched down the streets. I am told that protests are not unusual in European cities. We chose to bypass the action and walk a couple of blocks over from them, just in case. One night while walking down La Rambla, a tree-lined pedestrian mall that is famous for its shopping, we witnessed a woman rush out of a corner store with a stack of clothes clutched between her hands. She was followed by a security guard who wiped out flat on his face as he rounded a corner to catch her. He recovered from his fall and quickly gained on her. She dropped the clothing and fled. Honestly, we did not feel unsafe on our trip, but I did find it interesting how bold a snatcher can be. 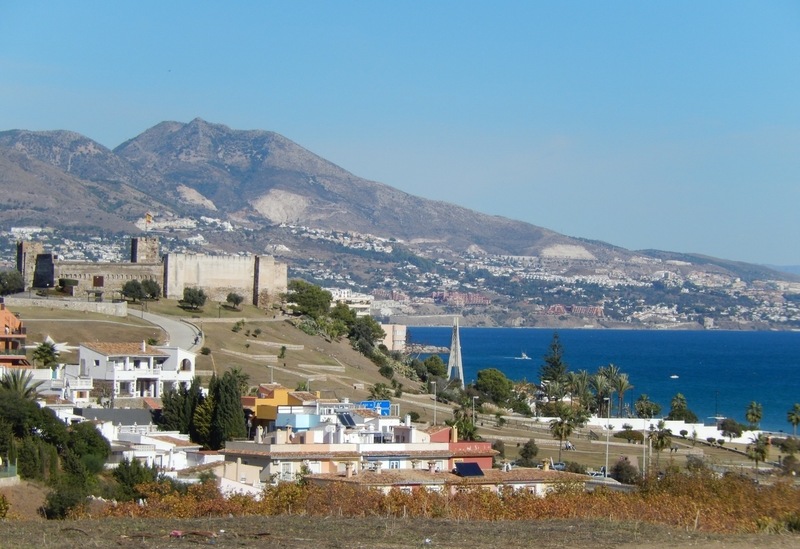 I’ll leave you with a picture of the view we had the pleasure of enjoying during our stay in Southern Spain and a picture of the castle that was near us. Of course, we walked along the Mediterranean Sea and up to the castle. That was the first of many walks. Many, many walks. Next blog will be about our adventure in Paris. We walked along the Mediterranean to this castle. We stayed at Hotel Oriente right on La Rambla and had tapas in a restaurant next door to it. There were also protests going on which were hard to tell the difference from celebrations. maybe its all an act to entertain tourists??? Loved having lunch with you !! 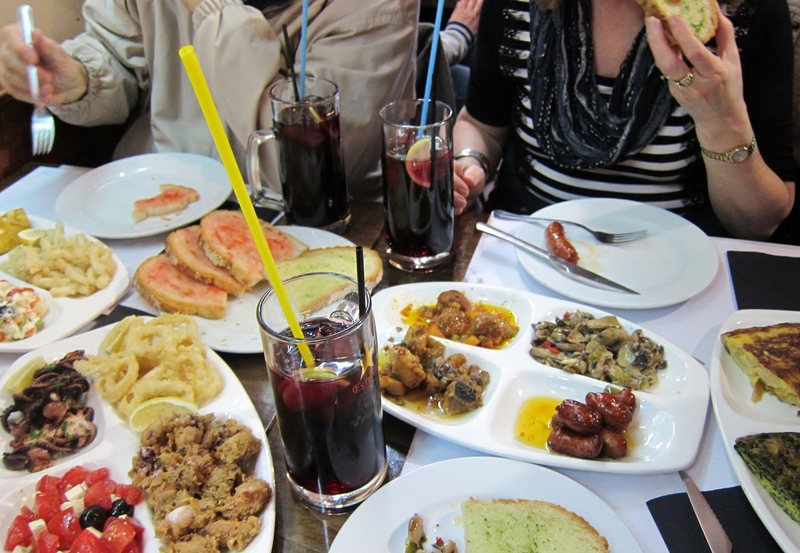 I really loved Barcelona and the tapas, too. We stayed just off La Rambla at Petit Museum Hotel. I don’t remember the name of the tapa restaurant, but it sure was good (and pricey). Loved having lunch with you, too.